Thank you for visiting this website and considering services from Jordan Wells Paving. We provide blacktop paving services for clients in Richmond, VA and the surrounding areas including Ashland, Amelia, Chester, Chesterfield, Colonial Heights, Dinwiddie, Emporia, Farmville, Goochland, Hanover, Henrico, Hopewell, Midlothian, Mechanicsville, Richmond, Short Pump and Petersburg. If you don't see your location, please contact us and we will try and accommodate you. ​Parking lot and/or roadway cracks and potholes repair, resurfacing, new installations of large or small parking lots and/or roads, pavement marking, and application of all types of sealcoating for maintenance. ​We offer installation of tar and chip parking lots or driveways- a less costly, yet durable option, for homeowner, industrial and commercial clients. ​We offer our commercial and residential paving services to all clients, regardless of the size of the job! If your asphalt driveway is cracked and invaded by grass, your business parking lot is faded and in disrepair or failing completely, let us help you. Jordan Wells Paving is a company founded 10 years ago by a 3rd generation VA blacktop paver. He grew up influenced by conversation around the dinner table concerning daily trials and successes of a father and grandfather in the Road/Driveway Paving business. This family’s generational paving company’s operations having been on display to Virginians decades proves commitment to community, hard work, and ethical business practices. Jordan Wells Paving knows how important the proper design, preparations and execution of laying down asphalt pavement is to achieving a long worry-free performance. We understand blacktop pavement’s hidden dangers to premature failure, due to water infiltration because of poor grading, insufficient materials laid down, and careless compaction of the layers in asphalt pavement. 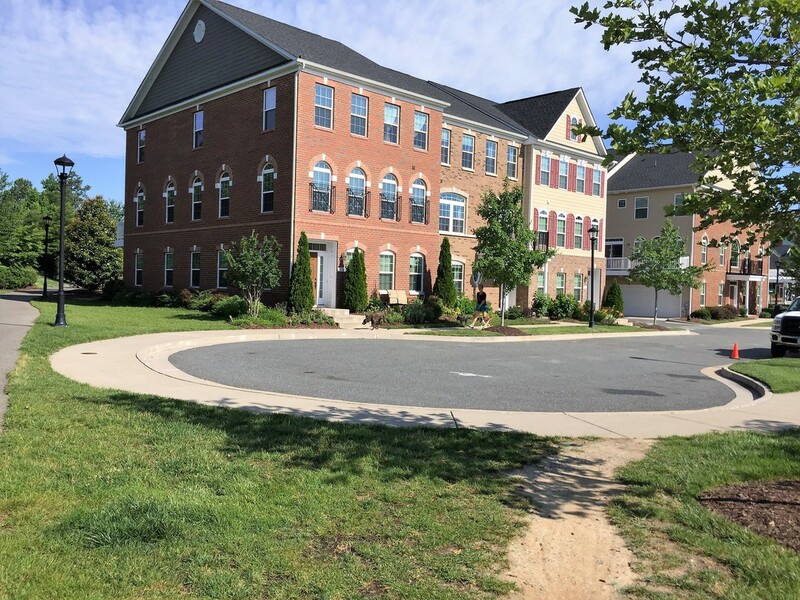 All of the previous considerations are paramount during our design process and then correctly implemented to provide our clients with a robust driveway, parking lot or road. We Background check our intended employee’s criminal records, and perform random Drug Testing. We are licensed, insured and bonded in the state of VA. Your Safety and Protection of your property is of paramount importance to us and we take extreme care to ensure it. Jordan Wells Paving excels at providing affordable accurate estimates, and in sending honest, hardworking, exceptionally trained employees to your Home or Business. Because most of our business develops from word-of-mouth referrals, our highest priority is excellent customer service. That Ribbon of darkness leading to your Garage is a substantial part of the home’s view and does have quite an impact on curb appeal. A broken up, weed infested asphalt driveway declares this home has not been maintained, besides the fact, that you or visitors will not have a dry smooth place to park. As soon as your driveway is showing cracks or potholes, contact a professional asphalt paver to inspect and repair it because it will only continue to deteriorate at perhaps a faster rate than before. Please considered asking Jordan Wells Paving to complementary inspect your driveway and extend (without conditions) an estimate for repair. Repair or replacement might be more affordable then you think. Call Jordan Wells Paving at (804) 823-7644. We will respond quickly and at your convenience schedule a time to come out. Asphalt Driveway with caution tape to keep cars off. Asphalt Resurfacing is a way of repairing existing worn but not severally damaged asphalt by paving over-top of it. There are certain preparations for resurfacing that include milling or shaving the original pavement into a more even surface to help match the existing landscape around it. Areas that are in very poor condition must be removed, pavement cleaned, adhesive tack coat laid down, and then the new asphalt can be applied in compacted layers. Resurfacing is less expensive than fully reconstructing a paved surface, and typically takes less time which makes it a more attractive option to businesses and homeowners alike. Homeowners who are not staying in their home long term but still want their driveway to look good for several more years will often choose resurfacing over reconstruction. 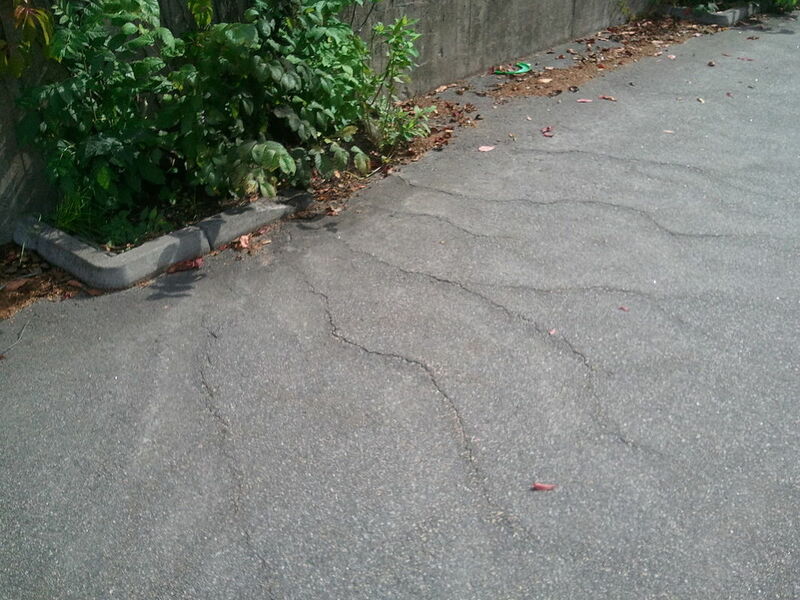 Life expectancy for a resurfaced parking lot is 8-15 years if maintained with periodic sealcoating and crack repair. The areas in the distressed asphalt that now puddle will again puddle since in most cases the grade cannot be altered by a resurface. Also, any problems with the subbase will still be there so any cracking in the existing asphalt will come back up through the overlay- this is called “reflective cracking”. The subbase under potholes should be fixed or once again your children can float a paper boat in it. Water is asphalt's greatest enemy- most of asphalt failures can be linked back to a subbase compromised by water so it's very important that water runs away from the asphalt pavement rather than towards it. Our inspectors have to make an on-site inspection to determine if your driveway is sufficiently intact for a resurface or overlay option. Call Jordan Wells Paving (804) 823-7624 to schedule a free on-site inspection. We will respond quickly and at your convenience make an inspection of your driveway. You don’t have to be present for the inspection. We will report our findings to you as soon as possible- usually a 24- hour turnaround. 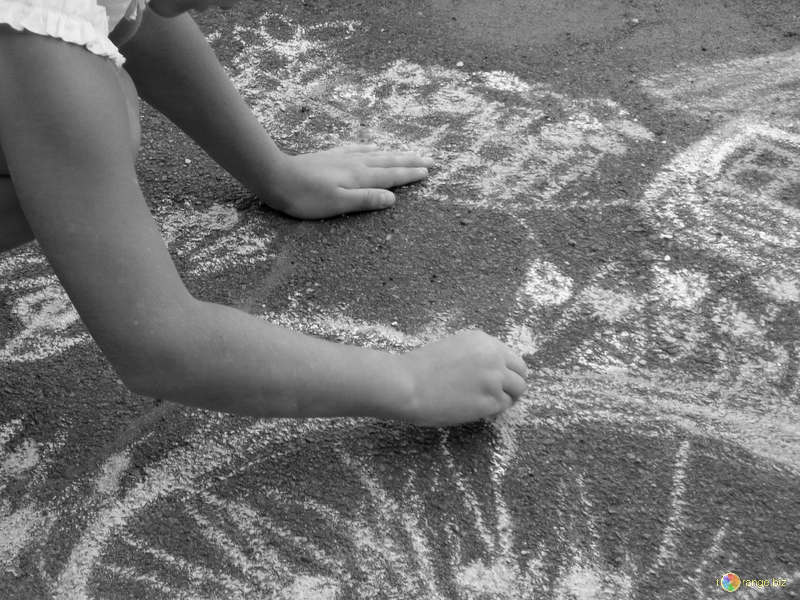 Let the kids draw on the Driveway rather than float boats. Floating a Paper Boat in a Driveway Pothole. 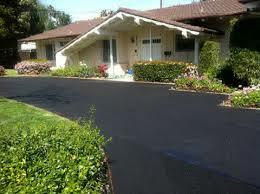 New Asphalt Driveways can last 30 years or more when properly built and maintained. Asphalt is pliable which makes it more forgiving than concrete when it comes to heaving from freeze and thaw cycles making it a better choice for driveways in more northern climates. Blacktop because of its color will melt the snow or ice much faster than other types of pavement. 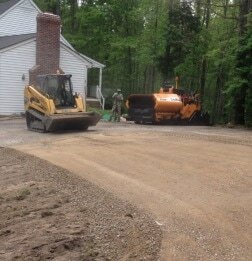 A new asphalt driveway can be installed by Jordan Wells paving in a relatively short period of time- usually within a few days after the sub-grade is done. The sub-grades installation time-frame depends upon many things such as: Removal of trees and their roots must be complete or they may show up through the pavement. The subsoil condition needs to be inspected and possible remediation taken if soft and unstable. The driveway design load must take the homeowners' lifestyle into account (heavy camper parking on it) or the driveway will fall into ruin at the heavy load sections. Because all homeowners needs are unique, sub-grade installation could take anywhere from less than a day to a few days. Dangerous to walk in high heels on broken pavement. 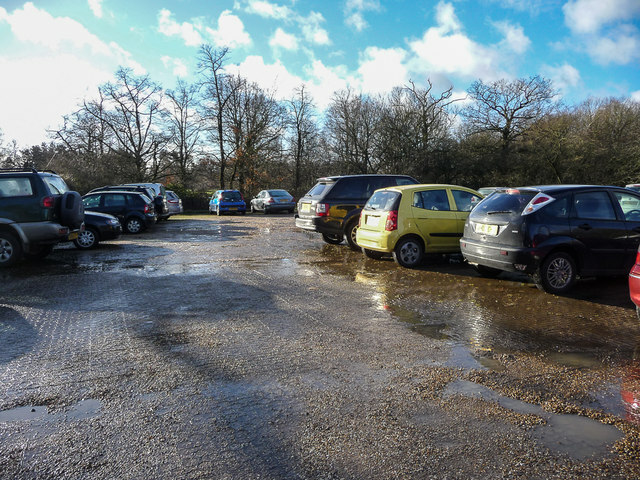 First impressions of a customer or client cautiously traversing a muddy gravel based parking lot is hard to counter even when a pleasant interior for shopping or service awaits. Seniors will definitely pass by such a business rather than take the substantial risk to weave through a broken parking lot. Many clients will pass by your business without dedicated parking instead of finding parking along the street- many just don’t want the trouble of a search or they don’t like to parallel park. We can build a new parking lot or resurface an ailing parking lot into a robust, long lasting and attractive parking lot that will inspire consumers to patronize your business. Sidewalks and pathways can also be designed and built to help drive and encourage foot traffic to your door. Overlaying or Resurfacing is less expensive than fully reconstructing a paved surface, and typically takes less time, making it a great option when considering major asphalt repairs. This is more appealing for a large parking lot as it is less costly to resurface a large area then to replace it. The badly damaged areas can be dug up and the subbase inspected and repaired before the pavement is laid. 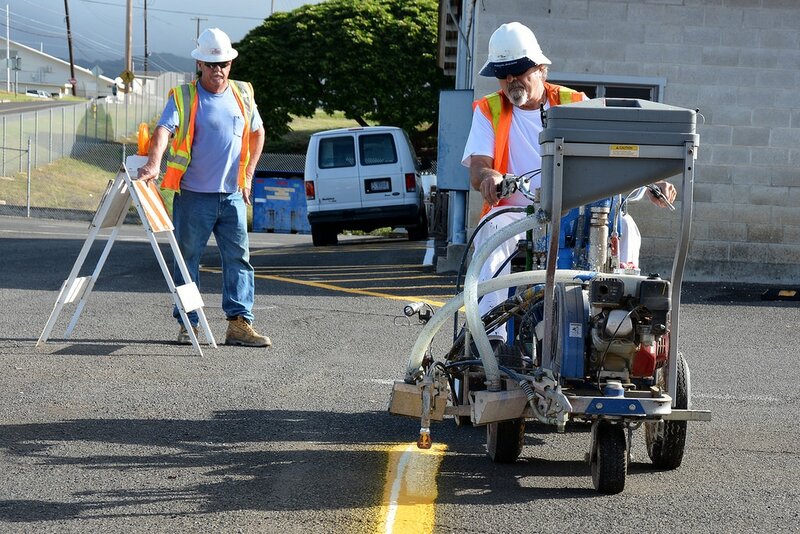 When the pavement has cooled, markings or striping can be reapplied. Apartments, medical clinics, schools and universities, condos, HOA communities and industrial parks will require the services of an asphalt company at implementation or repair at some point in the future, and recruiting someone experienced in asphalt paving will help the project progress rapidly without errors. Jordan Wells Paving designs and installs roads, paths, walkways and parking lots. We offer valuable advice learned over 3 generations- hopefully saving you from ill-advised guidance (offered up by those that believe they know the paving business). You will never be held up by us for costly mistakes that less experienced pavers make. Plus, we preform maintenance at regular intervals on our fleet of industrial specialized paving machines and trucks so no worries over rental equipment failings to push back your schedule. Correctly done Asphalt pavement’s functional role to a construction project is critical to the safety and overall impression of users, whether you’re building a road, a parking lot or a driveway. Potholes, cracks or poor grading creates an unwelcome, and possibly unsafe, experience for customers, guests, residents and other users. We offer application of all types of sealcoating to protect and waterproof asphalt pavement from the ravishes of UV rays, oil spills, gas spills and rain water- these are common oxidizers that slowly destroy the asphalt binder (the black glue that holds the crushed rock together). Sealcoating fills and smooths surface cracks and porous aged areas of asphalt producing a non-porous surface where dirt and debris easily washes off. Sealcoating should be done every 2 to 3 years otherwise you may end up with pealing and cracking if done too often. Most people think more is better when using sealers from the big box stores so they put on way too much- think of it as caking something on a flexing surface. Don't ruin your driveway give Jordan Wells Paving (804) 823-7644, an opportunity to complementary inspect your driveway. After the inspection, we will recommend a specific product that will suite the unique needs of your driveway; then using the chosen sealer, along with our professional application, we will seal your driveway to last longer and protect better than anything you can buy in the big box store. 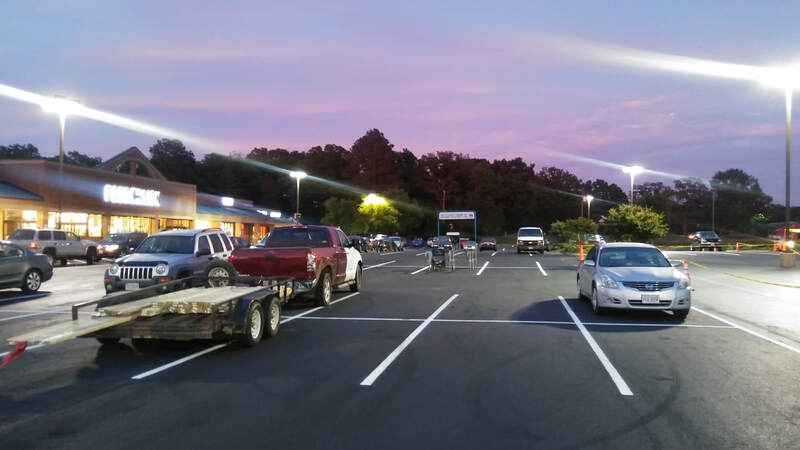 We provide the ADA required markings to keep customers, visitors and employees safe and to maximize your parking spaces.